The 6-series concept has “a shark-like nose” and a forward-leaning kidney grille. 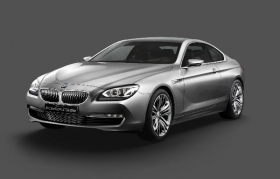 BMW AG will give its new 6-series coupe a more classically elegant form than the bullish appearance of the existing car. The new-generation 6 series will debut later this month at the Paris auto show as a concept that will be very close to the production car. The concept's refined styling was first shown on the four-door Grand Coupe concept in April at the Beijing auto show and it provides the 6 series with clear visual links to other recent BMW models. 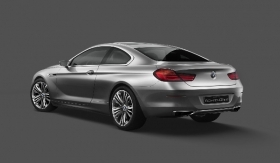 Most notably, there's a strong resemblance to the 5 series with which it shares rear-wheel-drive underpinnings. The new 6 series continues BMW's design revolution under Adrian von Hooydonk, whose mold-breaking Z9 Grand Turismo concept car first shown in 1999 laid down the styling template for today's 6 series. “With this car, I feel like I have come full circle. I was lucky enough to influence today's 6 series, and I've also been heavily involved in defining the new look of the coupe concept,” he said. Despite its billing as a concept, von Hooydonk confirms that the production version of the new 6 series will get only minor changes, including different mirror housings, tailpipes and less flamboyant wheels. “What you see is largely what we intend to place into production,” he said. The 6 series receives what von Hooydonk describes as “a shark-like nose” featuring highly technical headlamp graphics (to be offered with optional LED corona lenses like those featured on the concept), a forward-leaning kidney grille and a full air duct within the lower part of the bumper designed to accentuate width. The long hood -- a design cue reflecting the 6 series' longitudinal engine mounting -- is more contoured than before, and like the rest of the car's steel body, it boasts tauter surfacing than today's somewhat bloated-looking model. The addition of chrome around the side window graphic, which is virtually similar to that of the first-generation model, is aimed at enhancing overall elegance, giving the new 6 series a more upmarket flavor. The production 6 series will be similar to the Paris concept, shown. At the rear there are characteristic L-shaped taillights that use LED graphics similar to those seen on the 5 series. The trunk is also more integrated than before and now boasts a subtle spoiler integrated into the metal. A fabric roof convertible version is also due in 2011. BMW hasn't provided official figures, but company insiders confirm that the new 6 series is virtually the same length though it's a good deal wider and slightly lower than the current car. It also boasts an incremental increase in wheelbase along with wider tracks front and rear -- measures that help ensure the confident stance of the current model is retained. The added dimensions also boost interior accommodation, most notably in the rear. Inside, BMW's design team gave the new 6 series a unique asymmetrical dashboard that channels the German carmaker's early models by adding a center console angled toward the driver. BMW is not revealing the engine line, though the 6 series will use an eight-speed automatic transmission. Topping the range will be a successor to the M6 running a twin-turbocharged V8 in combination with a seven-speed dual-clutch transmission.